As the virtual curtain fell on “The Anger in Ernest & Ernestine” this tweet went out: venue is insane but the talent is undeniable. The setting in the tiny basement of the Backpacker’s Hostel on York Street is uninviting. 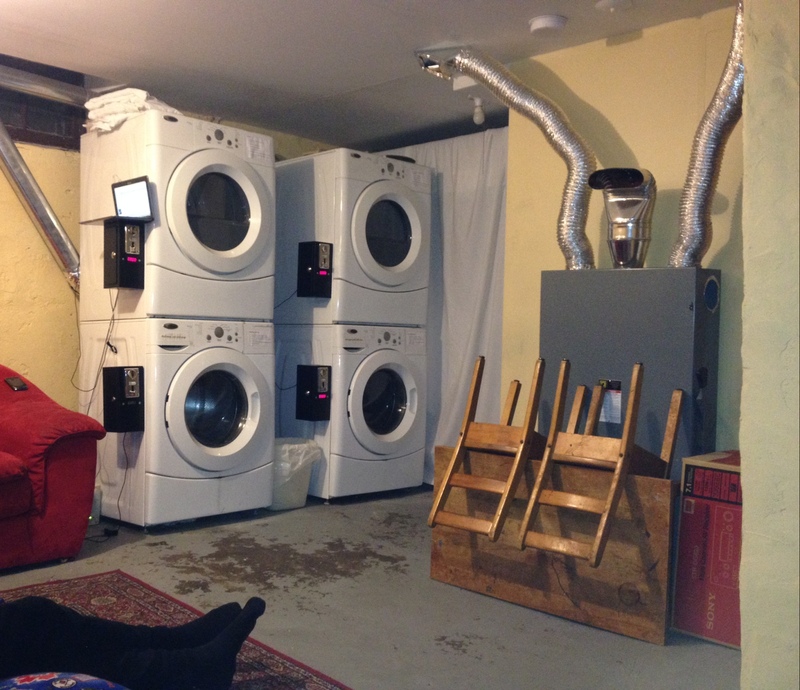 Seating –12 max- includes dingy stained sofas and cushions on the laundry room cement floor. With the actors literally at arm’s length it all heralds an amateur evening… and then the play begins. The 1987 work by Leah Cherniak, Robert Morgan and Martha Ross follows the downward trajectory of blissful newlyweds Ernest and Ernestine – and the simmering anger within each – as their relationship implodes in an overheated, cramped subterranean apartment. The tale of the growing cracks between the poorly matched free-spirited Ernestine & bookish methodical Ernest is in turn funny, relate-able and charming. The anger within each is embodied in shadow actors creating a vibrant four-hander dynamic as the wedded pair strive to balance each other and their internal “partners”. 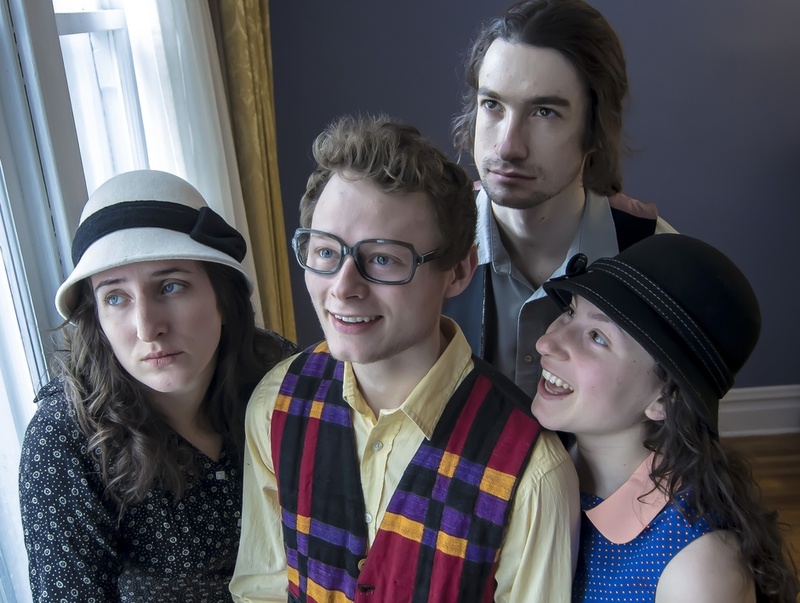 Graduates of the now defunct Ottawa Theatre School, Karina Milech (Ernestine) and Alexis Scott (the Anger in Ernestine), set up production company Vacant House Theatre six-months ago and this is their inaugural “site-specific” piece. Joining forces with Patrick Kelly (Ernest), Nicholas Wade Fournier (The Anger in Ernest) and director David Whiteley the actors fairly glide through the 90minute production in cramped constraints. The cast transport the audience in to the claustrophobia of their poky apartment, through their interior desperation and denial and across the city from bars to bird watching with an ease and professionalism completely at odds with the venue. Milech, Scott, Kelly and Fournier are equally successful in their roles and the relationships they bring the “stage”. From Milech & Scott’s frenzied make-up to Kelly & Fournier’s meticulous broom dance all four work harmoniously together neither upstaging nor drafting. These players are relentlessly committed to their character in an environment that leaves no room for error. As close as they are to their audience without margin for a missed beat or drop in energy they embody their roles with relish throughout with strong timing, subtle inflections and wonderfully choreographed intervals. I’m sold on this site-specific team. Catch this inaugural show and you’ll agree so long as the future performances equal the quality of Ernest & Ernestine than Vacant House is a whole lot more than a “location” gimmick. The Ottawa Backpackers Inn, 203 York St.